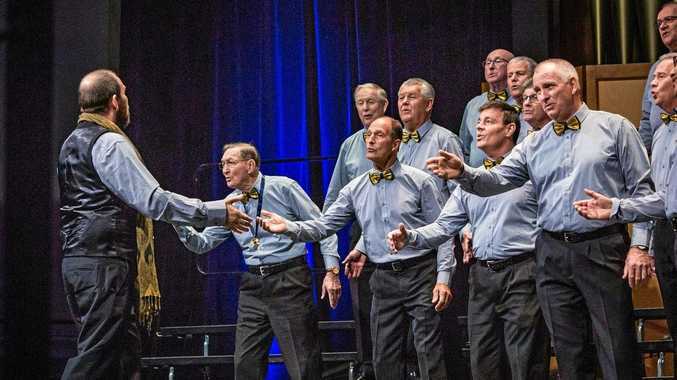 IN SYNC: The Sunshine Statesmen Barbershop Chorus competing in the 2018 National Convention in Adelaide. SURROUNDED by mates and for the sheer enjoyment of using the natural voice to entertain delighted crowds; this is why the Sunshine Statesmen Barbershop Chorus want more Coast men to join their ranks. You don't have to be a regular singer. You may not have raised your singing voice since your youth. You might have even been in a band in a past life. Or, you may not have any singing experience. You just need to hold a tune. "As long as they are not totally tone deaf," group secretary Peter Hall said. Barbershop is for men. They sing in four-part harmony without backing music. "We are aiming at people we can teach," he added. "They may be a bit wary about becoming because they haven't sung since they were say 15, but it's never a problem. Their ear is still there." Training is available under the guidance of a voice coaching team led by the choir's musical director, Brian Martin. The choir's next free Voice Coaching Program starts on May 1 at Buderim's Uniting Church Hall and runs for five weeks. Peter, 63, was in a boys choir at school in Townsville and then a youth band. During his working life he casually sang with a guitar in hand when with his friends. When he and his wife Marie moved to the Coast Peter got involved in other community groups, but found the Statesmen to be "far more social". "When we start our activity we immediately start smiling. We are singing, and singing fun songs," he said. The current choir members range in age from 50 through the group's founder and competitor, Dr Melvin McMichael who turns 90 this year. There are two streams to the Statesmen choir. One is socially sharing a range of songs with a variety organisations and groups across the Coast. Some of the performances are for free while for others the group is paid. Those funds are used to cover the cost of the practice hall hire, the musical director services, song copyright and for performance uniforms. The other is competition which usually includes about 20 of the 40 or more choir members. The choir has just moved up to a B Chorus in international ratings. There are regional, state, national and international events to participate in and competitions to contest. This year's Australian championship is in Hobart. The Statesman will be performing Chattanooga Choo Choo and I've Been Working on the Railroad. "We have dressed up railway-type outfits and we are paying a lady to come up from the Gold Coast to do the choreography for us," Peter said. While fun and fellowship is at the core of the Barbershop experience, there are also several valuable health benefits. "Individually we are training our brain," Peter said. Each choir member learns and remembers their part of a song. They have to learn a repertoire of about 40 songs. And they are also physically active, to the extent of their capabilities. "It's really like a Men's Shed for men who can't use tools but like to sing," Peter added. And for those who simply enjoy performing, the choir gives them a chance to return to the stage where appreciative crowds enjoy the purity of the men's voices which carry a sense of fun. For the ladies, Peter says partners help out with choir's fundraising and social activities. If they are keen to sing, he says there is a local women's group called Hot Ginger Chorus. For more information, go to sunshinestatesmen.com.